MC2 Seminars Will Transform Your Patient Results!! Learn the technique that everyone is talking about. When checking out, please use the Paypal link. We’re having some trouble with our regular cart processor. Thank you! MC2 is incredibly awesome! I was able to help a patient who was carried into my office because he was not able to walk. Two weeks later he was walking normally. I see a lot of extreme cases here and I am able to help most of them. Thanks for teaching it. Chiropractic really is bigger than the chiropractor. I was so amazed with this I had to send it to you…pre/post x-rays of a 12 year old that I adjusted with MC2 only five times! I have not worked with many kids with scoliosis before so I had no idea that such a dramatic change was possible. Apparently the orthopedic surgeon looked shocked…and told her to keep getting adjusted. Dr. Stephen Hoffman’s technique called MC2 is an excellent approach to tonal work. Dr. Steve’s teaching method involves a fantastic walk through the mind field (spelling is correct) of confusion that most DCs have when attempting to understand tonal work. Do not miss the opportunity to attend his program. I thoroughly enjoyed the experience. Your patients will thank you and so will your family! 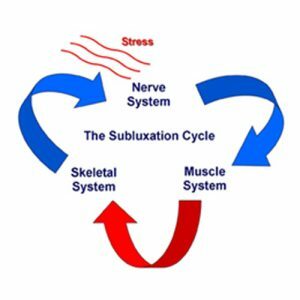 “It’s a contradiction to tell patients that body is a dynamic, self-healing organism and then adjust the same subluxation pattern visit after visit after visit. “Practicing, or putting into practice, high ideals is harder than most say. “As a freshman student in chiropractic college, I have been fearful. Register EARLY – All fees go up on May 1st! May ONLY be applied during the registration process. All savings credited at checkout. These special prices are valid until midnight 05/01/2019. Register EARLY – All fees go up on May 10th! All savings credited at checkout. These special prices are valid until midnight 05/10/2019. Register EARLY – All fees go up on May 28th! All savings credited at checkout. These special prices are valid until midnight 05/28/2019. “So easy to integrate with other techniques.” Briana B. Register EARLY – All fees go up on June 15th! All savings credited at checkout. These special prices are valid until midnight 06/15/2019. “Dr. Hoffman’s technique called MC2 is an excellent approach to tonal work.” Richard B. Register EARLY – All fees go up on June 28th! All savings credited at checkout. These special prices are valid until midnight 06/28/2019. We expect this to be a SOLD OUT program. Any coupon codes will be credited at checkout. Register EARLY – All fees go up on June 7th! $1900.00 for TWO Doctors (by June 7, 2019) * Best Pricing! $1000.00 for ONE Doctor (by June 7, 2019) *Best Pricing! All savings credited at checkout. “Practicing, or putting into practice, high ideals is harder than most say. MC2 is the closest I‘ve found to a bull’s eye! !” Rob H.
Register EARLY – All fees go up on July 25th! All savings credited at checkout. These special prices are valid until midnight 07/25/2019. $1900.00 for TWO Doctors (by July 21, 2019) * Best Pricing! $1000.00 for ONE Doctor (by July 21, 2019) *Best Pricing! Register EARLY – All fees go up on August 10th! For more location information contact Dr. Bruce Steinberg at 518-796-6563 (call or text) or via email at drbruce@queensburychiropractic.com. All savings credited at checkout. These special prices are valid until midnight 8/10/2019. $1895.00 for TWO Doctors (by July 14, 2019) * Best Pricing! $997.00 for ONE Doctor (by July 14, 2019) *Best Pricing! Register EARLY – All fees go up on September 15th! All savings credited at checkout. These special prices are valid until midnight 9/15/2019. Register EARLY – All fees go up on September 20th! All savings credited at checkout. These special prices are valid until midnight 9/20/2019. Register EARLY – All fees go up on October 5th! All savings credited at checkout. These special prices are valid until midnight 10/5/2019. Register EARLY – All fees go up on October 17th! All savings credited at checkout. These special prices are valid until midnight 10/17/2019. Experience a practice without contradiction. 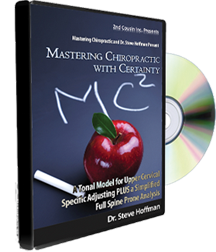 Combine the most important elements of the Philosophy, Science, and Art of Chiropractic. Video of this one-day seminar has been converted to Windows Media Video format and is instantly downloadable. The Integrator™ is the only chiropractic adjusting instrument that was developed out of randomized clinical trial, blinded and with placebo control. The study was designed by Robert Duncan, PhD., biostatistician, at the University of Miami School of Medicine, together with the Holder Research Institute and founded in part by a grant from the Florida Chiropractic Society. Years of development, testing and design went into creating an instrument that would deliver that 3rd dimensional dynamic that adjusting by hand embraced but that no other instrument in chiropractic delivered; “TORQUE” and “RECOIL”. THE INTEGRATOR reproduces the entire thrust and movement components of TOGGLE RECOIL, the classic Chiropractic Method of adjusting by hand at a speed of 1/10,000th of a second. No instrument in chiropractic history has been able to reproduce what the hands were intended to do! Please Note: Shipping of The Integrator will be restricted to addresses within the U.S. Orders placed for The Integrator outside of the U.S. will NOT be fulfilled. If placed, these orders, when refunded, will be subject to a 10% restocking fee in addition to any Foreign Transaction Fees. Save 10% AND get FREE Shipping when ordering the The Integrator™ and the MC2 Technical Mastery Seminar Video together! This offer not valid outside the U.S. See note above regarding refund policy. “Wow! I have never seen results like this in my office! I have a patient with spasmodic torticollis that she has had for over 35 years. With one adjustment her friends and family members commented on how straight she looked and that they can’t remember ever seeing her like this before.” Dr. Ron R.
The ArthroStim® instrument features a spring cushioned ‘floating stylus’ design that enables a practitioner to instantly increase and decrease the thrusting force simply by increasing or decreasing pressure against the body. 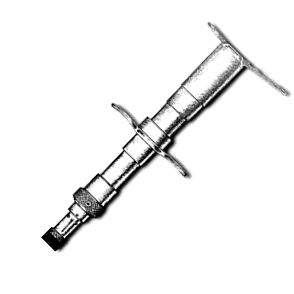 This permits the practitioner to utilize the ArthroStim® as an extension of their own hands. The spring cushioning produces a comfortable ‘end-feel’ to the thrust and it minimizes the forces returning to the practitioner. This makes the ArthroStim® much easier on the doctor’s hands and body than other devices often costing hundreds (or thousands) of dollars more. 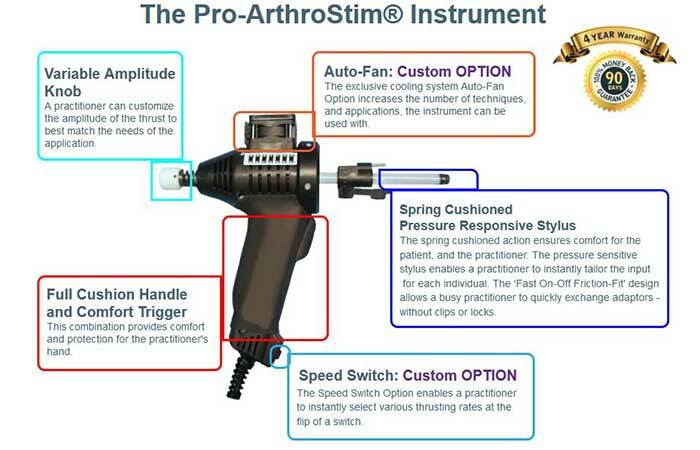 The rapid thrust and unique recoil produced by the ArthroStim® activates the patient’s proprioceptors and mechanoreceptors without recruiting the nocioceptors (pain receptors), providing the comfort today’s patient demands. Patients typically notice a positive difference with the first adjustment. Save 10% AND get FREE Shipping when ordering the Arthrostim and the MC2 Technical Mastery Seminar Video together!